I had a brilliant idea for a post yesterday. I took my children to a local orchard for pumpkins and apples and raspberries. As I wove my way through tangled vines and perfect orange globes and briars nearly stripped of the last berries of summer and trees heavy with fruit, I had a stroke of genius. Something so relevant and resonant. Something so beautiful. Something that needed to be written. 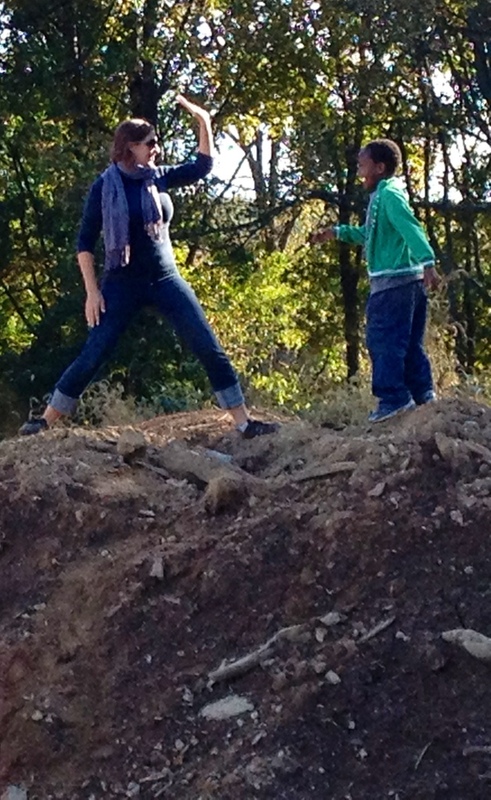 But my hands were sticky with the blood of berries and my son wanted me to race him to the top of a giant dirt pile and my daughter needed me to snap a photo of her picking an apple so she could use it as her new facebook profile photo. And so I didn’t capture the stroke of genius. I didn’t find a scrap of paper, a pen, an iphone app. “I’ll remember it,” I reassured myself. It was, after all, so clever, so beautiful. This morning it is gone. I remember only that it was brilliant and beautiful. As a writer, I mourn the loss of such ideas, chiding myself for not capturing them in the moment. As a mother, I can let them go. I won the race to the top of the hill, and then I gave my son a high five because he needs to learn how to be both a good loser and a good winner. We brought home six perfect pumpkins, five pounds of raspberries, three pecks of apples, and a jar of apple butter. We ate butternut squash soup for dinner with grilled apple butter-cheese sandwiches. We slept, tired from orchard air and sunshine and dirt hill races. And so, as the gray on the horizon starts to take on tinges of orange and pink, I bid my brilliance and my morning writing time goodbye. It is time to do laundry, to make breakfast, to edit for the employer who still pays my rent. Maybe I’ll take a notebook to the laundry room, just in case. Can relate to having ideas just fly away – constantly kicking myself for not having a notebook and pen on me at all times. At least you have a good reason to not scribble. Family is such a blessing, and so much better than plot points. Good to see you have the right priorities!